Recently, I have received statistics from a popular international server Statista. After reading the statistics I came to the conclusion that in spite of being meant for Forex trading, the rules are more or less universal and applicable to binary options trading, as well. These two sets of statistics indicate and explain why and how traders keep suffering losses as well as why other traders are profitable. Let’s take a look at the figures. First, I will show you why traders keep losing. The reason no.1 is too large a size of a trade (in other words, risking too much money). 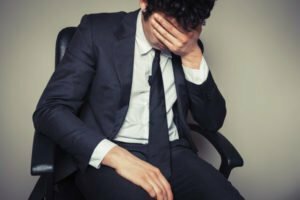 More than 44% of interviewees reported that excessive risking was the reason for not being profitable, a danger I keep stressing to the traders. I guess that all of you have at least once in your trader’s career played too high. Next time, you’d better not to do it! 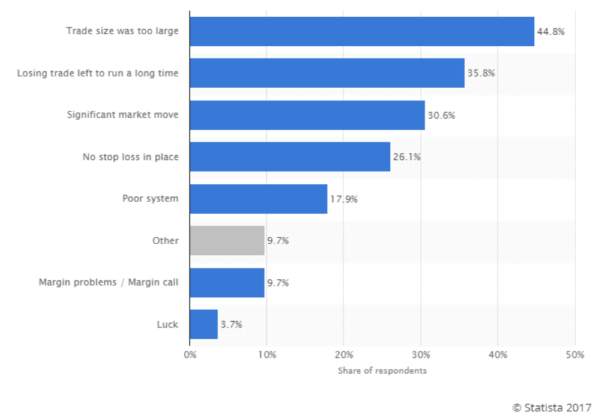 Just compare: Only 18 % of the interviewees named a poor trading system (in other words, a bad strategy) as the reason for their failure. Thus, you can say that correct money management is even more important than your trading strategy. TIP: In our series Money Management you will learn more details about this issue, for instance what is the recommended investment maximum, how to secure the earnings etc. Reason number 2: losing trade left to run too long. This is an issue binary options traders needn’t care about because binary options trading has no time limits and as such cannot be influenced by the trader. However, when trading cryptocurrencies, Forex or CFD we do care. Therefore, I recommend you stick to Let your winners run, cut your losses short. Practically this means to set your stop-loss at a shorter distance than your take-profit. I personally use a trailing stop. This brings us to another reason (…. why traders keep losing) – no stop-loss in place, which results in a big loss before the trader is ever able to close the position. The third most frequent reason (reported by 35% interviewees) was significant market moves, a phenomenon we all know. When trading based on the technical analysis, we tend to forget watching the latest market news. Suddenly the chart moves by tens of pips within a single minute, a result of which is our loss. Therefore, I recommend you read a news in the economic calendar (here). Although this calendar doesn’t contain all news, I believe that reading it will help you avoid at least half of significant major moves in the market. Next, to why traders keep losing, the statistics indicate what is behind successful deals. I was a bit taken aback by seeing the significant market move as the top and most frequent answer (reported by 42% traders). Does this mean that these traders do their trading based on a fundamental analysis? The second answer is directly related to what I mentioned a few paragraphs above. Up to 35% successful trades are thanks to the “Let your winners run” rule. 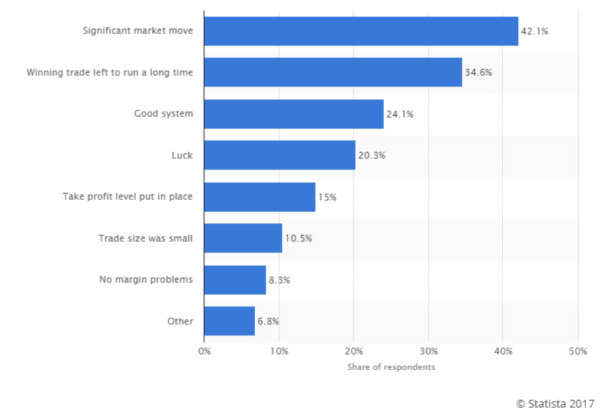 Unlike in the ranking of loss-making trades, “good system” (in other words, good strategy) is in the third place followed by luck. Recap: What do the best trader do? To make a brief recapitulation, below you can find five tips for trading both binary options, and Forex/CFD. It’s wise to stick strictly to these recommendations. It is the only way to boost your chances to be profitable. 1) Don’t put at risk too large a size of your trade. Though you may find closing a gap a funny exercise it is definitely not a wise strategy. Sooner or later, it will let you down. Believe me. 2) Watch carefully all the latest economic news. The failure to do so may cripple your trading. 3) Before you plunge in live trading using real money, always test trading on a demo account IQ Option offers its demo account for free. The same applies to each new strategy provided that you are not a novice in the business. 4) Unless trading binary options, but CFD, put stop loss always in place. Ideally, set the stop-loss at a shorter distance than the take-profit. 5) When trading keep your head cool and emotions under control not to lose your focus. I hope you have enjoyed the article. I wish you best of luck and strong nerves while trading!